FandangoNOW's very first digital video series sounds like a show right after our own heart: "Extreme Home Theaters" highlights, in short two- to three-minute episodes, interesting and unique home theater designs. The free show is available through the FandangoNOW app on many streaming media devices, as well as directly at FandangoNow.com. 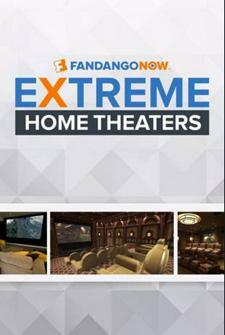 Fandango's premium on-demand video service, FandangoNOW, debuts its first digital video series, "Extreme Home Theaters," devoted to the world's most exciting home theater setups at FandangoNOW.com. Hosted by radio and TV personality Frank Kramer, the show's two-to-three-minute episodes will give viewers an insider's look at rooftop cinemas, massive man caves with hidden flat screens and fantasy-themed home movie palaces, and feature interviews with the designers of these spectacular home hideaways. "It's always fascinating to see how far movie fans will go to elevate the home viewing experience," says Adam Rockmore, Chief Marketing Officer of Fandango. "FandangoNOW is all about enjoying the best entertainment at home and on the go. Our new short-form series complements the FandangoNOW experience, as it celebrates the most incredible home theater equipment and settings imaginable." The show's host, Frank Kramer, is a well-known radio and TV talk show personality who has ruled the FM dial for more than two decades. His morning radio show, "The Frosty, Heidi & Frank Show" (@fhfshow, with co-hosts Frosty Stilwell and Heidi Hamilton) can be heard weekdays on 95.5 KLOS-FM in Los Angeles. He can also be seen every weeknight on the popular entertainment news program "Dish Nation." "Extreme Home Theaters" can be found at FandangoNOW.com and on FandangoNOW's "Extras" YouTube channel. • FandangoNOW Added to Xbox Gaming Consoles at HomeTheaterReview.com. • VIZIO Adds FandangoNOW to Its SmartCast Platform at HomeTheaterReview.com.